With the benchtop refractometer AR2008 the Brix values and refractive index are measured electronically. 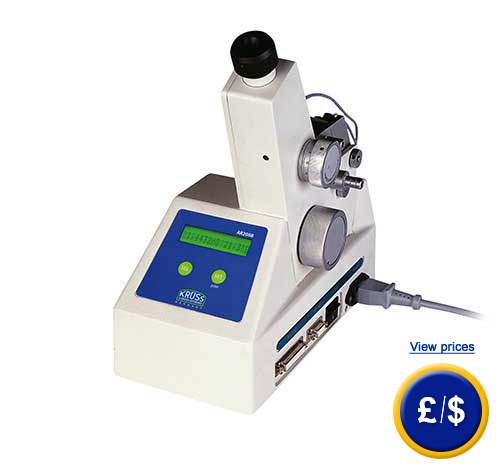 The measurements are displayed on a LCD screen on the socket of the benchtop refractometer AR2008. The benchtop refractometer’s measuring range is from 0 to 95% Brix, and the refractive index is from 1.3000 nD to 1.7200 nD. In addition to liquid and pasty mediums, the benchtop refractometer AR2008 also measures solid materials thanks to its prisms and mirrors. Because of the 589 nm LED illumination of the benchtop refractometer AR2008, there can be no falsification of results due to artificial light, for example from bulbs or fluorescent lighting. Furthermore, the measurements are exact due to the homogenous illumination. In order to prevent the temperature from falsifying the measuring results, the automatic temperature compensator can be activated in the benchtop refractometer AR2008 and a water circuit can be connected to moderate the prisms. From the RS-232 and RS-422 connections in the socket, the measurements of the benchtop refractometer AR2008 can be sent to a printer or computer. If there are any questions about the benchtop refractometer AR2008 have a look at the technical specification below or call: UK customers +44(0) 23 809 870 30 / US customers +1-410-387-7703. Our technicians and engineers will gladly advise you in all benchtop refractometers and all products in the field of measuring instruments, regulation and control and scales. This page in German in Italian in Spanish in Croatian in French in Dutch in Hungarian in Polish in Serbian in Russian in Turkish and in Portuguese .